In the first year under offensive coordinator Scott Parr’s Air Raid offense, Eastern Illinois ranks 16th in the FCS in total offense, averaging 465.4 yards a game. 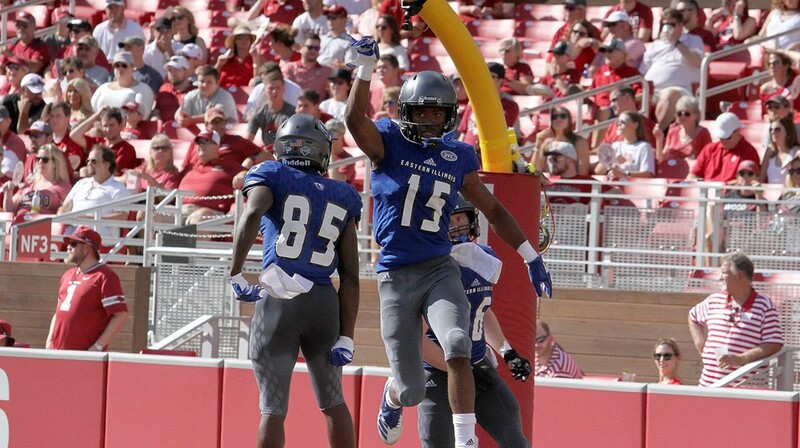 No player had shined more than senior wide receiver Alexander Hollins. The Mississippi native leads the nation with nine touchdown catches and ranks second in receiving yards (601) and receptions per game (8.6). In our weekly Moving the Chains feature, Hollins discusses the origin of his nickname, his favorite spot on EIU’s Charleston campus, the play that showcased his skills on the hit Netflix series “Last Chance U” and the most underappreciated people in the Panthers’ program. We got Allie from Alexander and the B was for Boddy, which was my last name before my mother passed away. A friend of mine, who is like a brother, gave me the name in about seventh grade because I could jump high. He was two years older than me, so I always looked up to him. It stuck with me ever since. Everybody calls me Allie B – coaches, a few teachers and all family and friends. It’s probably the academic center. It’s a place for me to go in and do some work, and I can go in there and talk to our advisor, Miss Cindy (Almon). You can talk to her about anything. She’s really like our mother away from home. She means a lot to everybody on the team, and she’s a real nice lady. As an opposing player at Copiah-Lincoln Community College in Mississippi, you caught a touchdown pass that was part of an episode of “Last Chance U.” How do you find out about being on the show? In high school, I committed to East Mississippi (the school featured on the show). The coaches at Co-Lin told me to do my research on their graduation rates, and (EMCC) had too many receivers coming back. I took some time to think and my brother helped me out. I signed with Co-Lin, and that was one of the best decisions I ever made. It was great playing against them. All of our teammates watched it together. We were watching and I said, ‘Hey, that’s me on there catching a touchdown!’ Once I noticed myself, I put it on Facebook. What was the play that was called for the touchdown? We ran the same play in our first game that season against Itawamba Community College. I dropped that pass. After the game was over, my coach said, ‘We’re going to come back to that play again and you’re going to make that play.’ The play was Quad 7 Falcon. We had two receivers to the left side, two to the right side and a running back to the left of the quarterback. It was a play-action where the running back picked up the outside blitz. The slot receiver had the post route to take away the safety. I had a skinny post. Our quarterback threw a good ball and I made a good play. If you weren’t playing football, what sport would you be playing? I actually thought I was going to be a basketball player. It was always my first love. I was a point guard. My strength was driving to the hole and scoring, getting to the free-throw line. But my junior year of high school football was my breakout season, and I knew football was going to get me into college for free. Do you have a favorite sports jersey? My favorite is my LeBron James Cavaliers jersey. Now that he’s a Laker, I’ve got to get me a LeBron Lakers jersey. Wherever LeBron goes, that’s where I’m going to go. Who are the best defensive backs you’ve ever played against? My juco teammate, Isaiah Swopes, who plays at the University of Northern Colorado, and my Eastern teammate, Mark Williams. Those two guys are the best. They just play the position very well. When you’re having a bad day, which teammate can always make you laugh? We’ve got some funny guys on this season, but I’d said our free safety, Iziah Gulley. He’s a joke teller. He tells funny stories. He’s got great jokes. Are you a good cook? What are your favorite dishes to make? I’m not that good of a cook, but since I’m from Mississippi, I obviously know how to fry. I can do simple things like macaroni, string beans and stuff like that. I can bake a little bit. But I like to fry. That’s what we do in Mississippi. We fry just about anything and everything. Who’s the best cook on the EIU team? (Sophomore quarterback) Scotty Gilkey. He can cook ANYTHING. We have a couple more guys like (linebacker) Jareem Fleming and (defensive lineman) Taylon Shepard who can cook. But if one of those three call, I’m going to have to go with Scotty. Do you have a favorite restaurant in Charleston? I would say Taste Chicago Style Chicken. It’s fried chicken that reminds me of home. Who are the most underappreciated people in the football program? Our strength and conditioning coaches. Coach (Jordan) Davis, our head football strength and conditioning coach, and those guys do everything they can to make sure we’re getting stronger and we’re taking care of our bodies. It’s Coach Davis, Coach (Derek) Stein and Coach P (Sebastian Pearson). They do a great job with us.